About: Chris Gerlach joined the NMI squad as a Graduate Assistant back in 2013 after getting his New Media Certificate during his undergrad. Diving in deep, he took on an array of tasks from web and graphic design to stage prop construction. 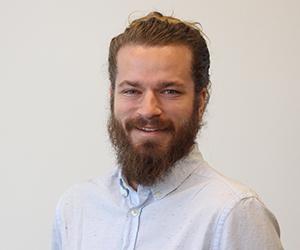 After graduation, Chris remained on board as an Instructor, and today, he teaches New Media Design, New Media Production, New Media Capstone, and an array of courses in the Emerging Media Master’s concentration! When he’s not in the office or classroom, you can find him in the woods hunting (or can you? ), at the IM fields/Ramsey trying to ball, or on his couch beating you in Call of Duty (#nerd).